Discover the cultural side to Thailand as we explore hilltop temples, cruise on a converted rice barge and unwind on the island of Koh Samet. We discover the ruined temples of the former royal capital Ayutthaya and visit the renowned 'Bridge over the River Kwai'. We take a longtail boat along the Kwai Noi River to our jungle raft houses , visit a Mon village and try bamboo rafting. Finally we travel to the tropical beaches of Koh Samet, an unspoilt National Park, where we can relax on the pristine beaches, snorkel in the clear waters or enjoy a boat trip around secluded bays. Arrive Bangkok and check-in at the hotel. The rest of the day is free. You may choose to take an optional cruise along the city's Klongs (canals) in a traditional longtail boat. This is the ideal way to explore Bangkok's network of meandering waterways that branch off from the main channel of the Chao Phraya River. The excursion will also include visits to the Royal Barge Museum and the iconic Wat Arun, the Temple of the Dawn, which was built to represent the towering slopes of Mount Meru, the home to the gods of Khmer mythology. Our sightseeing tour this morning is on foot and includes the Grand Palace with its stunning Emerald Buddha and Wat Po (Temple of the Reclining Buddha). The afternoon is left free, then in the evening we board the overnight train for Chiang Mai. Chiang Mai offers a complete contrast and relief from the heat and noise of Bangkok. Its elevation is just over 300m, so the climate is most agreeable. Founded in the 13th century, it owes its prosperity mainly to the teak trade. Our sightseeing will include the famous Doi Suthep temple and an orientation walk of the old town. This morning we head out to the Elephant Nature Park, one of the largest elephant conservation centres in Thailand. The park comprises of huge swathes of land for the elephants to roam in, along with an elephant nursery and hospital caring for sick and abandoned elephants. Its main function is for the treatment and care of rescued elephants although visitors and tourists are now admitted to assist and volunteer with the valuable conservation work. Our plan for the day will need to be flexible around the needs of the elephants, but is likely to include helping to feed the elephants from a viewing platform in the morning and in the afternoon we will walk down to the river with the elephants and centre's staff. Here we can witness these gentle giants as they happily splash around in the river, washing and cooling themselves down from the midday sun. There are no elephant shows or elephant riding here, the day is all about spending quality time with these beautiful creatures and observing their natural behaviours when they are with their herd. Today we head south to Si Satchanalai the twin city to Sukhothai. Although architecturally very different, it is just as impressive in many ways with a variety of outside influences noticeable in the construction of the wats and chedis (religious memorials). The most impressive and most sacred is Wat Chang Lom. Situated in the heart of the old city it is decorated with 39 standing elephants and is unusual due to its Ceylonese-style chedi - the earliest of its kind in Thailand. After visiting the site we make our way to the small community of Natonchan, a rural village set amongst lush rice paddies where we will enjoy the warm hospitality of a homestay for the night. After being greeted by our hosts and having some time to settle into our rooms we head out to explore the village on foot. The villagers here still practice many cottage industries, and as we walk from house to house we will see how clothes are stitched on a bamboo sewing rig, cups and chopsticks are made from surrounding bamboo and ornaments are skilfully carved by local artisans. There will be plenty of opportunity to engage with the villagers whilst each of them demonstrates their craft. We return to our homestay for a sundowner and a hearty meal cooked by our hosts. The homestay in Nathon Chan is simple but clean, comfortable and homely. Rooms are twin share with mattresses on the floor, all bedding and mosquito nets are provided and there are shared western toilets and showers. Please note that larger groups may be split between two nearby homes. Day 6 - In Sukothai, explore old city ruins by bicycle; drive to Uthai Thani via UNESCO site of Kamphaengphet. This morning we make the short drive to Sukothai, and once here we plan to explore the old city by bicycle. Sukothai was the first capital of Siam; which was at the pinnacle of Thai civilisation for over 200 years up to the end of the 1400s. It then went into decline as Ayutthaya took over as the most important city in the area, and was deserted until it was discovered as a lost city in the jungle in the 19th Century. The city has now been fully excavated and it comprises 21 historical sites within the city walls and a further 70 outside. Leaving Sukhothai by bus, we continue our journey south towards Uthai Thani. Along the way we make a stop at the historical site of Kamphaengphet, a UNESCO World Heritage site and little-visited town which contains a wealth of 13th-17th century temples, statues and buildings. The ancient walled town featured as an important city under the Sukothai Kingdom by protecting it from invaders, and we will spend time exploring the old royal palace and temples before driving onto Uthai Thani. Upon arrival, the rest of the afternoon is free. This morning we plan a visit to a local market before boarding a traditional boat for a trip along the Sakraekrang River . As we drift down the sleepy meandering waters we get a real insight into the authentic life of the indigenous river dwellers and boat people. There's plenty of time to relax and enjoy the passing scenery. The trip ends back at Utahai Thani for lunch. We then head south by bus where we reach another of Siam's stunning ancient capitals, Ayutthaya. Situated on an island at the confluence of three rivers, the Chao Phraya, Pa Sak and Lopburi Rivers, Ayutthaya had a very strong defensive position and retained its power for over 400 years, during which time it became extremely wealthy. Now a UNESCO World Heritage site, the city is still a stunning complex of palaces, shrines, stupas and monasteries. We will include a walking tour to visit the Royal Palace and a few wats. An early morning drive, by-passing Bangkok takes us to the River Kwai and Kanchanaburi, where we visit the war cemetery and the famous Bridge over the River Kwai. The building of the bridge and the Death Railway as it has become known, is one of the most infamous episodes of the Second World War. 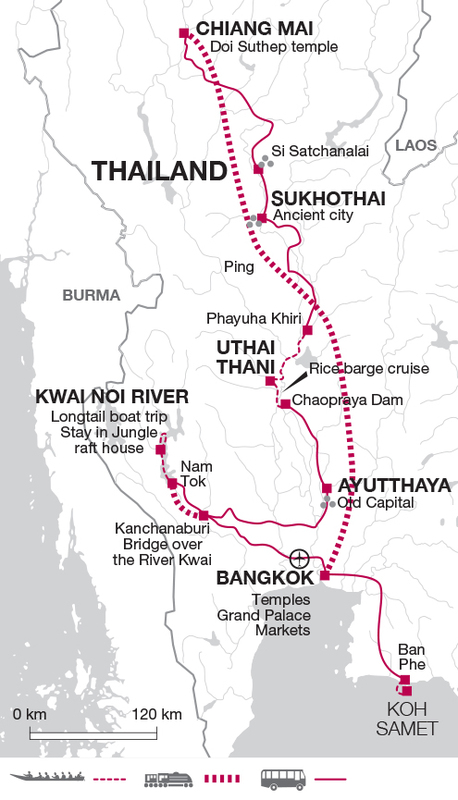 The Japanese built the railway to link Siam and Burma (Myanmar) using Prisoners of War between June 1942 and October 1943. It was to carry supplies to their fast expanding empire and by doing so it would cut almost 1300 miles off the sea route from Japan. The working conditions were atrocious and over 16000 allied troops lost their lives as well as an estimated 75,000 Asian forced labourers. We then take the train along part of the original route. We continue by bus to the Hellfire Pass and visit the Memorial Museum. Finally we transfer to longtail boats for a journey up the River Kwai to our Raft Houses, set in a tranquil location on the river's edge. We spend a full day here exploring the jungle and the river both on foot and by bamboo rafts. There is also the option to visit a nearby Mon minority village, or the eerie Lawa cave complex. Alternatively you may prefer to simply relax in your raft house and watch the world go by. We leave the peaceful surroundings of the Kwai Noi River this morning as we join the road and head back towards the capital. On our way back will we stop by the small town of Maeklong, home to one of the most unusual spots in Thailand. The Maeklong Railway Market was established in 1905 to better transport the fresh seafood from the nearby port to the city and surrounding provinces. The market has been built, quite literally, on top of the railway and each time the provincial train rumbles through a mind-boggling spectacle unfolds; the shades and canopies are all folded back, produce is deftly rolled away from the tracks and then train slowly passes through, mere millimetres from the surrounding markets and vendors. We plan to arrive today in time to witness this bizarre but fascinating event, with time left to look around the market and the variety of fresh produce on offer. We then continue on to Bangkok, where the rest of the afternoon has been left free for some last minute shopping or further exploration of this Asian metropolis. Please note: whilst on Koh Samet this extension is unescorted. This is essentially a time for rest and relaxation. You could swim and unwind on the beach or there are various optional excursions such as boat trips and snorkelling that can be paid for locally. The next two days are free to do as little or as much as you like. Today you have another opportunity to swim, snorkel or simply relax on the beach enjoying the sunshine. Today we transfer by boat back to the mainland and drive to Bangkok. Tour ends after breakfast. If you have time you may wish to wander through Chinatown for a different flavour of the city. Pack essentially for hot weather. Lightweight rainwear is advisable all year. Shorts, open backed sandals and bare shoulders are not permitted in the Grand Palace in Bangkok. Comfy shoes, trainers & sandals. Should consist of a main piece of baggage and a daypack large enough to carry clothes for an overnight stop. Bring a torch and waterbottle. Although entirely voluntary, tipping is a recognised part of life in this region of the world. Some local staff will look to members of the group for personal recognition of particular services provided. Accordingly, you should allow approximately £25. As one of our best selling tours this adventure to Thailand really gets under the skin of the destination and gives travellers an in-depth discovery of the history and culture of the country. Often associated only with beaches this trip is a revelation, as you will see ancient lost cities, explore glittering temples, and spend a night in a raft house on the legendary River Kwai. This is a great holiday for history lovers who want to understand the 'real' Thailand as well as spend a couple of days relaxing on the beach afterwards.